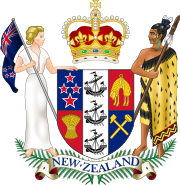 The Constitution Act 1986 is the principal formal statement of New Zealand's constitution. It ended the last remaining associations of New Zealand with the British Parliament. After the 1984 election, there was an awkward transfer of power from the outgoing Third National government to the new Fourth Labour government in the midst of a financial crisis. Outgoing Prime Minister Sir Robert Muldoon was unwilling initially to accept instructions from the incoming Prime Minister-elect David Lange to devalue the currency. Eventually he relented, but only after his own party caucus had threatened to replace him. An Officials Committee on Constitutional Reform was established by the Labour Government to review New Zealand's constitutional law, and the Constitution Act resulted from two reports by this Committee. The issue of the transfer of power from incumbent to elect governments (and hence prime ministers) was not resolved by this Act, however, and the transfer of executive powers remains an unwritten constitutional convention, known as the 'caretaker convention'. The Act repealed the New Zealand Constitution Act 1852, renamed the General Assembly as the "Parliament of New Zealand" and ended the right of the Parliament of the United Kingdom to legislate with the consent of the New Zealand Parliament. This page was last modified on 28 May 2015, at 00:53.